Youth-centered leadership development has long been a pillar of IMAN’s organizing work, and in our surrounding community, young men of color face particular challenges as they navigate the schools and other institutions. 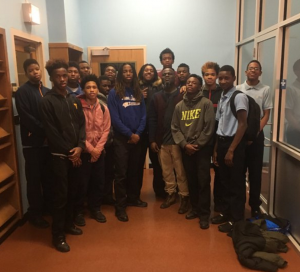 Recognizing the need for an accessible, constructive outlet, Organizing Director Shamar Hemphill, along with leadership from community partner Catalyst Maria Charter School, established the Young Men’s Leadership Group in 2015. The initiative has continued to flourish, helping cultivate the next generation of change makers on the Southwest Side. The central goal of the group is to encourage the young men—who are current Catalyst Maria students—to understand themselves as leaders, both in school and among their peers in the larger community. During their regular after-school meetings, Hemphill leads the group through activities that push them to consider what student leadership looks like and how those skills translate into a positive impact elsewhere. An ethos of accountability runs through all of the group’s work together, as each of the young men are tasked with helping one another remain on an upward academic trajectory. IMAN strives to serve as a vehicle for community members of all ages to effect positive change. The Young Men’s Leadership Group continues that effort as it helps to connect shared histories and build power for future leaders. This entry was posted in Direct Services, News, Organizing & Advocacy, Youth Services by IMAN Staff. Bookmark the permalink.